My thoughts: If I remember correctly, I first heard of Ilona Andrews on All Things Urban Fantasy where Abigail was raving about the Kate Daniels series. I don't know why I waited so long to order and then read it, because once I did, I was utterly captured by the magical universe Ilona Andrews created and became devoted to the Kate Daniels series. The characters are all well developed and the actions are decribed in such a vivid and detailed way, you feel as if you were right there in the middle of the story. 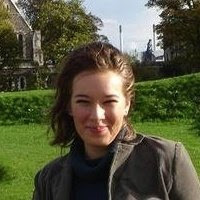 The novel is narrated in the first person by the protagonist, Kate Daniels, a young twenty-something brave woman, who is alone in the world, having lost her father not too long ago, her mother when she was still a child, and now her only remaining family her guardian, good friend of her father was murdered. Kate works as a mercenery cleaning up magical problems. She is a strong yet very real character with flaws and insecurities. It is very refreshing to see a heroine who isn't perfect but human. Kate's humour is bitingly sarcastic, she has bravado and a big mouth and tells off people who try to intimidate her. My favourite parts were her interactions with Curran, the Lord Beast, king of all weres. He, who is used to obedience and respect gets none of these from Kate. The first time they meet she calls him "Kitty, kitty", while he is a huge impressive golden lion! Just a small glimpse and you can understand why this novel made me chuckle so many times, which surprised me, usually urban fantasy novels aren't that funny. Well, Ilona Andrews series is an exception! Ilona Andrews finds the perfect balance between packing the novel full of fast paced action and still developing details and spending time on deeper feelings, and she tops it all with fantastically humourous dialogues! Curran is one of the main characters, the impressive and ruggedly handsome Lord Beast, king of all weres. He is extremely arrogant, frustrating the hell out of Kate, but responsible, brave and protective at the same time. He is a true leader figure and an irresisitible hero. His banter and cocky lines to Kate makes this novel so entertaining. Verdict: This is a wonderful start to a fantastic new series! The story is fast paced, never dull due to the twists and turns, the characterisation is wonderful and another trait which makes Ilona Andrews and the Kate Daniels series outstanding is the humour! 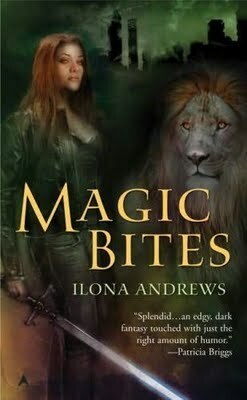 A truly enjoyable read, if you haven't read any Ilona Andrews books yet, don't tarry, go and procure yourself either Magic Bites (the 1st in the Kate Daniels series) or On the Edge (the 1st in The Edge series), you will thank me! ;-) Fans of Kelley Armstrong, urban fantasy lovers, this series is for you!